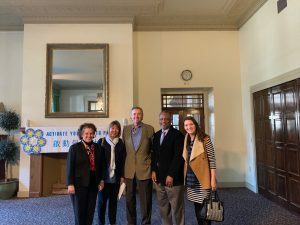 HUD researchers visit Hotel Oakland Village! On March 14th, 2018, Hotel Oakland Village and Corinne Jan, CEO of Family Bridges, met with two HUD researchers, Cindy Campbell and Calvin Johnson, regarding their Aging in Place research project on supportive services and the Village movement. Cindy and Calvin are part of the US and Japanese partnership that is researching the challenges of an aging population. The two countries are exchanging research regarding what aging strategies have been successful. Hotel Oakland Village is grateful to have been identified as a successful example of aging in place! We were happy to share our story and strategies with Cindy & Calvin and look forward to collaborating with them in the future. ← Hotel Oakland Village excited to announce Health Literacy program during 2019 – Seminars announced!